ZESTRON will feature VIGON® RC 303 at the SMTA New England Expo. Additionally, we will raffle a sample of VIGON® RC 303 cleaning agent complete with our pressure sprayer. Manassas, VA – November 8, 2017 ZESTRON, the globally leading provider of high precision cleaning products, services and training solutions in the electronics manufacturing and semiconductor industries, is pleased to feature our oven cleaning maintenance product, VIGON® RC 303, at the SMTA New England Expo on November 16th. Additionally, we will raffle a sample of VIGON® RC 303 cleaning agent complete with our newly developed pressure sprayer during the expo. 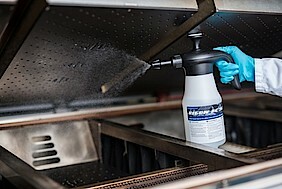 “We are excited to offer an oven cleaning maintenance product that in combination with our pressure sprayer, makes oven cleaning fast and efficient,” said Sal Sparacino, Sales and Marketing Manager, ZESTRON. VIGON® RC 303 is a water-based cleaning agent specifically developed to remove all types of baked-on flux residues from reflow ovens and wave solder systems. It also removes re-condensed fluxes and emissions from condensation traps and heat exchangers. The Pressure Sprayer is developed for spraying large surfaces within seconds. The refillable pressure sprayer is the ideal solution for cleaning reflow ovens and wave solder systems as well as for the manual cleaning of oven parts, such as condensations traps or solder frames. Winners will be drawn from our booth at the conclusion of the event. The SMTA New England Expo and Tech Forum will be held at the DCU Center on November 16th. For more information or to register, please visit smta.org.